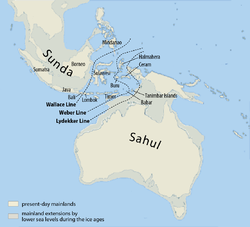 Wallace's line delineates Australian and Southeast Asian fauna. The probable extent of land at the time of the last glacial maximum, when the sea level was more than 110 m lower than today, is shown in grey. Note the deep water of the Lombok Strait between the islands of Bali and Lombok formed a water barrier even when lower sea levels linked the now-separated islands and landmasses on either side. Australasia is one of the world's great geographical regions. It is unified in natural history and geology because of its ancient origin as part of the supercontinent Gondwana. It is the geographical area which contains the Australasian ecozone. Australasia's region is Oceania. It comprises Australia, New Zealand, the island of New Guinea, and neighbouring islands in the Pacific Ocean. This page was last changed on 7 February 2014, at 22:13.